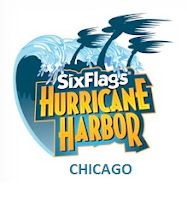 Welcome to Hurricane Harbor Chicago. Six Flags Great America's waterpark is free to all season pass holders and membership holders. However, it is a $10 upcharge to those with general admission tickets to the main park. WipeOut is a slide where up to four riders slide down on a clover-leaf raft and navigate two small funnels on the way down. Surf Rider is a simulated surfing ride that uses jetted water to create a surfing environment. Along the route you will encounter different water obstacles including waterfalls, leaky buckets and even a wave machine that powers riders around the course. This tower of slides has combination of of tube and body slides. The two bowl slides on the right are Typhoon and Vortex. In the middle the light blue and yellow slides are Hammerhead and Barracuda. The two body slides seen closest to the camera are Paradise Plunge and Riptide. Hurricane Bay is the park's wave pool. Bahama Mama and Bubba Tubba are both located on the same tower. These are both family raft slides that can accommodate up to 4 riders at a time. Wahoo Racer is a down hill head first raft racer slide. In the far back part of the park is Hurricane Mountain, a collection of 4 rafts slides. Skull Island is the mega water fortress in the middle of the park. This water fortress is easily one of the largest out there. Always have a good time at this water park.